Our work has shown that floor lifts are unsafe. Pushing and turning these devices requires too much force to be exerted by caregivers and increases worker’s risk of back injury – particularly with bariatric (very large) patients. So we prefer that healthcare workers use overhead lifts whenever possible. However, it is not possible to put overhead lift track everywhere so a mobile lift is still needed. Existing bariatric floor lifts weight 400lbs by themselves and have a capacity of lifting 1000lbs patients. 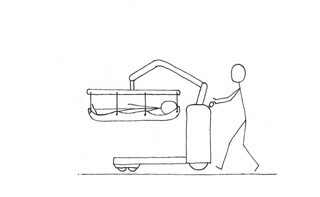 So a healthcare worker may end up maneuvering 1400lbs! This is like pushing around a small car like a Volkswagen Beetle or Smart Car that weighs ~1700lbs. Working closely with, Tollos, we are designing the next generation of floor lifts that can have powered drive wheels that allow it to be driven.